Two things are worrying Market: (1) Would unrest spread to other Arab countries, particularly Saudi Arabia and Persian Gulf Arab States (major oil producing countries)? (2) Would unrest delay or stop goods, specially oil, shipped through Suez Canal? From what I've read (btw, http://www.juancole.com/ is an excellent source for ME news and analysis in my opinion), it's highly unlikely for unrest to spread to ME major oil producing countries. Also so far, unrest and protests had very little impact on shipping in Suez Canal. Once that becomes evident, Market would rally from the oversold condition that it's in now. 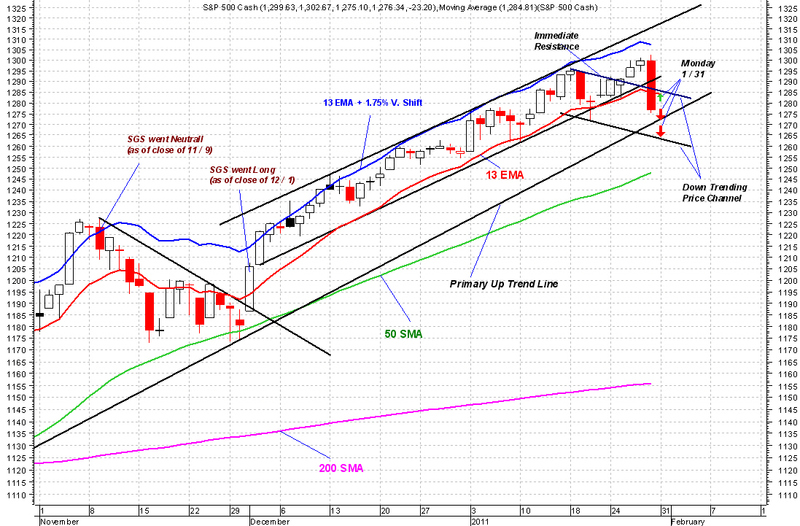 That could happen as early as tomorrow and SPX could rally to back test its 13D EMA around mid 1280's. There is also a good chance for further selling if things get completely out of control in Egypt. In that case, SPX very likely breaks through the Primary Uptrend Line, currently around 1270, and sells off to the lower channel line of the Down Trending Price Channel, around 1260. 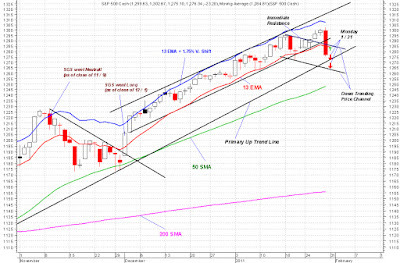 Tomorrow, Jan 31, I'm hoping for a rally in SPX to retest its 13D EMA. I would unload my IT positions into that rally if it happens. Otherwise I will unload my IT positions sometime near close.